In a large bowl, mix together all the dressing ingredients and whisk thoroughly. Add cabbage, carrots, onions, jalapeños, and ginger, then toss to combine with the dressing. In a large bowl, combine the garlic and ginger with the ground pork and beef. Set aside. Sauté onions in 1 tablespoon canola oil for 4-5 minutes. Add soy sauce, brown sugar, salt & pepper, Gochujang, 1 teaspoon sesame oil, and pepper flakes to the onions and stir. Add the meat mixture, and cook thoroughly, breaking up meat with a spoon. Cook about 6-7 minutes. Meanwhile, wrap taco boats in foil and heat in oven for 5 minutes. 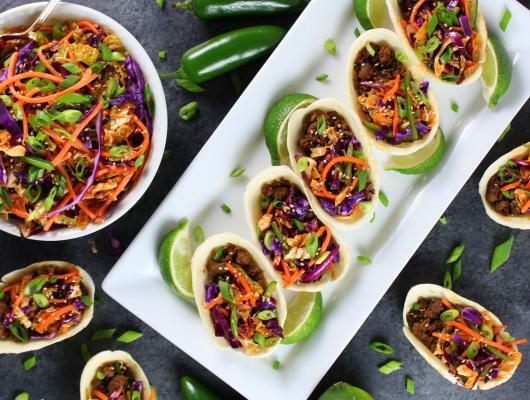 Add 1 tablespoon of meat to each mini boat and top with Spicy Asian Slaw. Garnish with green onions, lime wedges and toasted Sesame seeds. * The slaw ingredients like carrots and cabbage can be purchased already shredded at most grocery stores. Although it's slightly more expensive, it can be worth it if you're looking to save time. * This recipe can be prepped a day in advance. Cook the meat as per these instructions, and store separately. Prep all the slaw veggies and store them each in their own resealable plastic bag. Mix and store the dressing in a separate container, and combine the dressing with the rest of the slaw ingredients 15-30 minutes before serving. 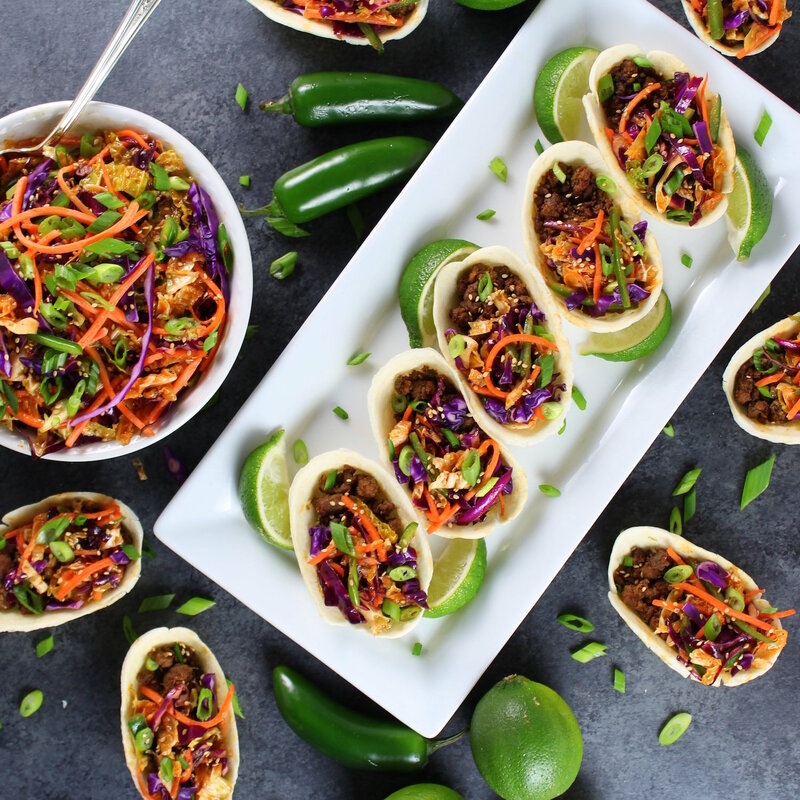 Korean Mini Taco Boats with Spicy Asian Slaw - With sautéed onions, fresh ginger, garlic, sesame oil, ground beef & pork... layered w/spicy Asian slaw.